The best part about the season’s changing is it warrants a new wardrobe! Who doesn’t look forward to adding a few new fall statements to their wardrobe? I know I sure do. 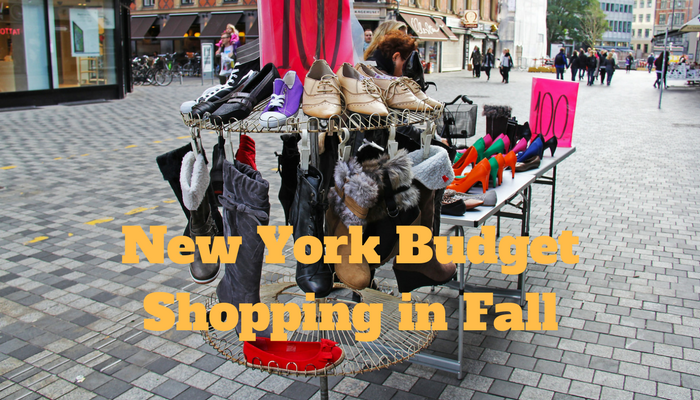 However, sometimes fall shopping in New York can get pricey-sweaters, jeans, and coats, but no fear I am here to tell you all a few tricks on the trade of saving money while looking fall-fabulous! First off, check out the “End of season” sales at stores. From Zara to Pac Sun, there is always an end of season sale at most retailers. They are trying to clear out the stock for fall/winter items, but, lucky for you some items that land on the sale rack from summer can still be worn in the autumn! I recently went to H&M on 59th Street and spent sometime shopping on the sale rack there. 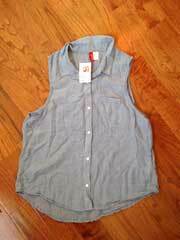 Surprisingly, I bought the chambray tank top pictured to the left for a mere $7. While you may say, “Well, why would you buy a tank top when it’s going to be cold soon?” Well, this little number will fit perfectly under any flannel shirt or cardigan. So, I plan to layer away and stay stylishly warm. Check out H&M for some pieces or for the same shirt I bought. Next, shop at off-price retailers. There’s a great store located in Midtown called De Janiero. While there are several locations scattered in Manhattan, the one I shop at is down the block from Grand Central and a few stores down from Crumbs Bakeshop. While the visual display of the store isn’t all that enticing, hidden inside are precious gems-well, made of cotton and polyster, that is. There is a huge assortment from under shirts to stylish boots, that are sure to prep you well for the coming months. Just strolling through the store was like navigating a maze with surprises at every corner. I saw the chic military green parka that has become a staple of young girls here in the city for under $30. It even had cute pleather sleeves, the jacket was a total style steal. There are racks upon racks of dresses labeled $14.99+ or $7.99+. The best part about this store? None of the stuff is cheap looking, it is all of decent quality and is decently priced. While some labels are lesser known, you can find some well-known labels throughout the store. 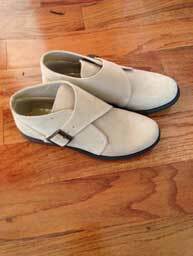 I was able to score cute ankle boots by Dollhouse-as seen in the picture provided-for only $15. To me, that was fantastic. So, for all of you looking to save some money but look sharp, definitely make a trip to a De Janiero in the city. It will be well worth it. Lastly, there is always the option of secondhand shops or thrift stores. From Goodwill to Cauz for Pawz, there are so many thrift stores to choose from. If your budget is super tight, as mine is being in college, another go-to-trick is thrifting. You can find some super nice pieces and it is always fun to see what you come out with! With sweaters usually priced under $10, and shirts around $4-6, you honestly can’t go wrong. Both you and your wallet will be happy. Hey, maybe you will even find an ugly Holiday sweater.